Some of us have faced the daunting task of having to pack our big game animals out of the bush on our backs. Have you ever harvested an animal out beyond mechanized transport reach? I know I have found myself out hunting and realized that if I get an animal... "How on earth can I get it out from here?" Carrying it may be the only solution. How do we break our animal down into pieces so we can get them into our backpacks? If you are going to pack an animal on your back, is it really necessary to gut it before cutting it into pieces? If you are asking this question then let us weigh out the differences of the two methods; gutting and gutless. The gutting method of field dressing lends itself better to taking your animal out of the bush whole or at least quartered. You shoot it then gut it, load it into your mode of transport and away you go. Once you reach your camp (or whatever) the task of skinning the animal can begin. Now that being said, for field dressing large game such as a moose it is not as easy to do as it is to say. Maybe you will want to quarter your big game animal first; then you must gut it before you can load it. Quartering big game at least breaks it into manageable sized pieces for handling. Gutting is a messy process. I have found it almost impossible to gut moose sized game without getting blood all over my shirt and pants. I try to keep as clean as I can but blood all the way up both arms and usually, if nowhere else, on my knees is the norm. Moose are large and I almost always find myself kneeling in blood, at least at some point during the gutting process. 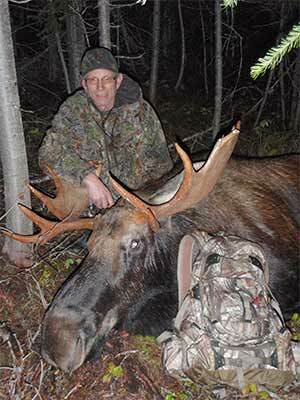 Quartering Moose: For those of you who wish to quarter your moose sized game for transporting, before you remove the entrails you will have to decide either to transport with or without hide on the animal. If you plan to remove the hide for transport, how will you keep the meat clean? You may find it easier to remove the hide once the gutting has taken place. Then either roll the gut pile out of your way or roll your animal away from the gut pile. You don't want to contaminate your meat with the blood, stomach contents or feces. Once moved you can quarter your animal in the method you have chosen (we will discuss that on another page). The gutless method is just that... leave the guts inside the body cavity. It is not a difficult procedure one you have seen it done. The video that is featured here is actually field dressing of an Elk using the gutless method. You can use this same principal on any big game, large or small. "Why use the gutless method at all?" you ask. Hunters that venture far afield, I mean miles and miles into the backwoods will tell you why. It has everything to do with weight and cleanliness. Consider the Elk in the video; if the hunters did not break the animal into smaller sections without the bones attached they would end up carrying the extra weight of the bones too. Admittedly there will be some waste with this method, a person just cannot spend the time required to gather all the meat bits that remain connected to bone. You will miss out on using the bones for soup and the extra flavour that bone marrow will add to your roasts. That is the sacrifice you make. Sure you could pack out the entire animal, bones and all. It would only mean a few extra trips over hill and dale; you could do it... right! Not I, boned out and as few trips as absolutely necessary is the only way to go in my opinion. Update: The Alaska Department of Fish and Game has put out its own video on the gutless method for field dressing moose. This is a very informative video and I highly recommend watching it. Fred EIchler demonstrates the gutless method of field dressing leaving the hide on. I think once you watch it once or twice you will agree... these guys make it look pretty easy. My friend emailed me with this response after I shared the video with him. "Those guys DO make that method look easy! Something I'll have to try for sure...especially if I'm ever on my own." Our own video on field dressing moose can be seen on our YouTube channel by clicking Moose Field-Dressing. This is a gutting method demonstration, as well I introduce a few tricks to use while gutting. Check it out and do not forget to click the thumbs up button and subscribe to our channel. It is always free on YouTube. Moose Hunting Tips Book Buy-It-Now!